Mattel’s Hot Wheels line has released a treat for Batman fans, with the latest Limited Edition Batmobile. “Not another Batmobile...” I hear you sigh, but read on, for this is a biggie 1:18 scale diecast model, with opening sections that reveal enough inner details to make it a unique entry for the Batman memorabilia shelf. Features include a lift-up front panel, under which lurks a neatly-produced engine, and next to it, a standard-issue car battery. Venture inside the double-bubble canopy via the opening doors, and you should see the red Batphone, complete with retro-style wiggly wiring; there’s also fine red piping adorning the seat trim and plenty of cabin detail. Behind the seating area are a trio of rocket launchers, while continuing aft, you find another lift-up panel, revealing computer systems and some fairly mysterious Bat-tech equipment. Winning touches for me are the finely-lettered twin parachute packs (labelled 'Bat chutes') positioned either side of the atomic turbine exhaust. 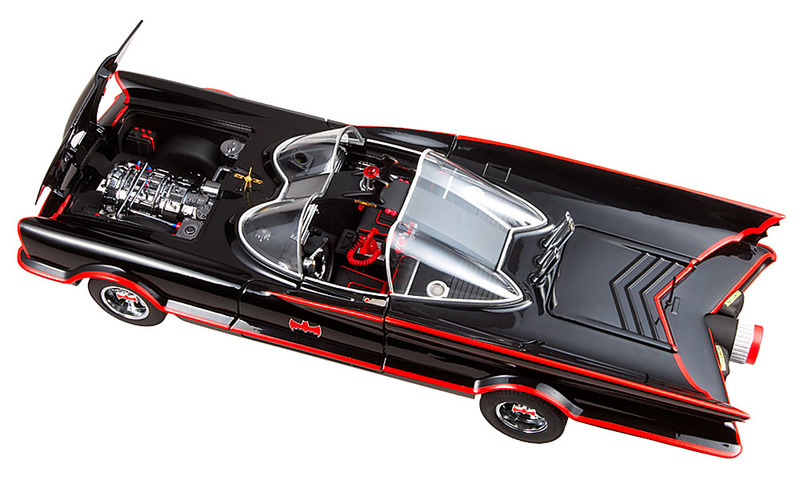 All in all, this is the best and most-detailed Batmobile we’ve seen at this scale. The Batmobile story is a long one, originating with the gorgeous Lincoln Futura concept car that was unveiled at the 1955 Chicago Auto Show. The Futura was a two-seater, with instruments in the steering wheel, push-button transmission, exterior microphones to receive and transmit traffic sounds, and a galaxy of other futuristic stuff. The car was hand-built in Turin, Italy, and was never put into production. Instead it was bought - for a nominal one dollar - by the legendary designer-customizer George Barris. 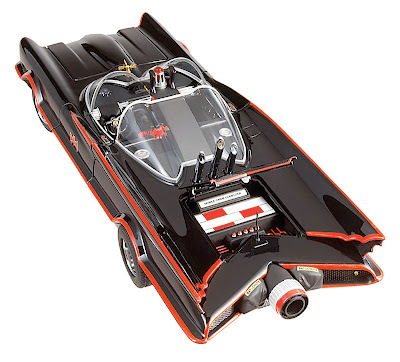 It’s said that the transformation from Futura concept car to Batmobile star car took place because Barris was the only source of rolling hardware that could be modded in a few weeks for an upcoming Batman TV series. As built, the Barris Batmobile tipped the scales with a curb weight of nearly 2.5 tonnes, was 5.74 m (18.8 ft) long, and powered by a V-8 engine masquerading as a super-advanced atomic turbine. 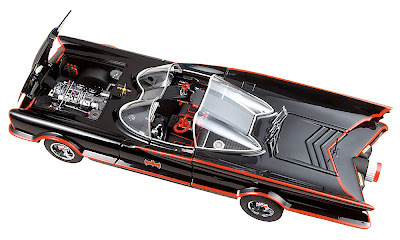 The model is also available in black or chrome, 3000 of each, and helps celebrate the 70th year since the Batmobile first drove across the frames of the Batman comic book, way back in 1941. 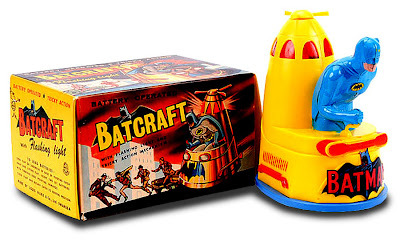 Last but not least, here’s a fun little Louis Marx Batcraft toy we chanced on recently - a rare gem for a serious Batman collector, and here just for fun! More Batmobile articles here and here. ModelZone has the Batmobile here. The Dark Knight Tumbler version of the Batmobile is also available here.